Welcome to Villa Hauma, meaning beautiful rice fields. This stunning 3 bedroom villa gives the discerning traveler a taste of the "real Bali" set among spectacular rice fields with panoramic view. 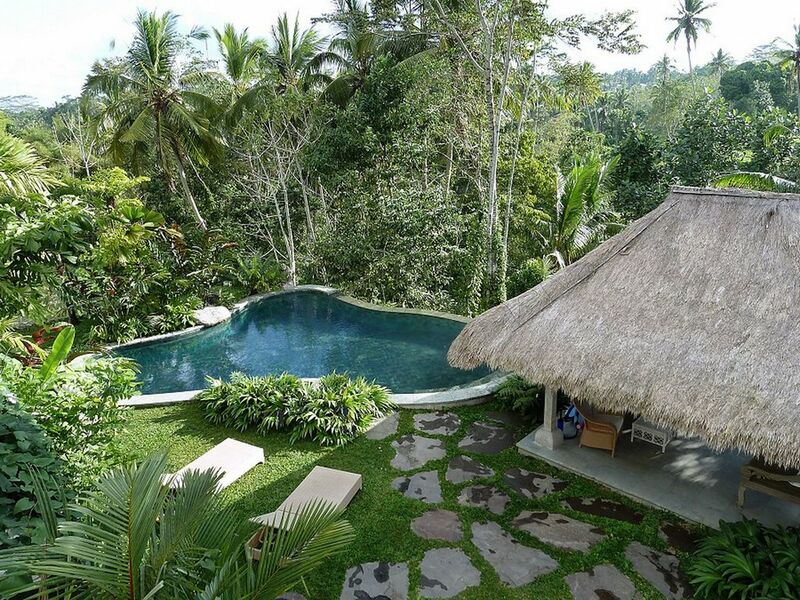 This beautiful house is just a fifteen minute drive from Ubud, tranquility in the countryside. Surrounded by paddy fields and forest, with far reaching views towards the coast, this is a haven to relax in. A lazy dip in the pool is all the exertion you will need to muster! Set within a large garden, the house itself is generously proportioned. Leading from the entrance hall is a well equipped country style kitchen. A book-lined sitting room, with huge feather filled sofas, opens on one side to a Study/ Television room, and on the other through sliding doors to connect with a deep verandah for dining. More doors lead out to the garden and pool, and a pretty thatched open-sided seating area, beside the pool. From the hall, up the curving staircase, are three bedrooms. The main bedroom, with balconies on both sides, has a dressing room and bathroom. Two further bedrooms (one opening onto the larger balcony), share a bathroom. There are plenty of feather pillows, beautiful cotton bed linens and generous bath towels. The mattresses are king size (180x200 cms) "Serta" latex, and very comfortable. There is a child's cot and high chair. Two housekeepers will clean, do laundry, shop and cook. Their hours are nine until five every day except Sunday. There is a gardener/pool man, and a night security man. Good selection of books, but please leave them in the house for others to enjoy! All the water has been through a filtration system. You can safely drink from any tap. At your own cost transport can be made available for airport transfers, into Ubud, and an excellent guide for excursions around the island. A fact sheet is available with useful information, to help make the most of exploring Bali, and staying as a guest in this gorgeous home. Please state in your inquiry if you'd require airport transfers. There's a transfer fee of IDR 350K one way for one cara, to fit 4 people and luggage (surcharge of IDR 50K if the transfer is between 9pm - 7am). Fee payable to driver directly. Stunning home, peaceful and serene setting, wonderful staff to assist us, couldn't have been any better! We feel very blessed to have come across this property and to have been able to stay here with our family. The size of the house is impressive, large scale rooms with beautiful colonial architecture and the rock pool is just amazing! We were fortunate to have been able to see a troop of wild monkeys on the edge of the paddy field when we woke one morning, so memorable. The gardens are truly breathtaking and the gardener is just lovely. Our housekeepers made the best breakfasts and dinners!! Our driver was very knowledgeable and obliging, waiting for us to have dinner or shop was no problem. Staying just a short drive from Ubud meant that we were really able to relax in the peaceful atmosphere of Villa Hauma. We would be back to stay again in a heartbeat! !